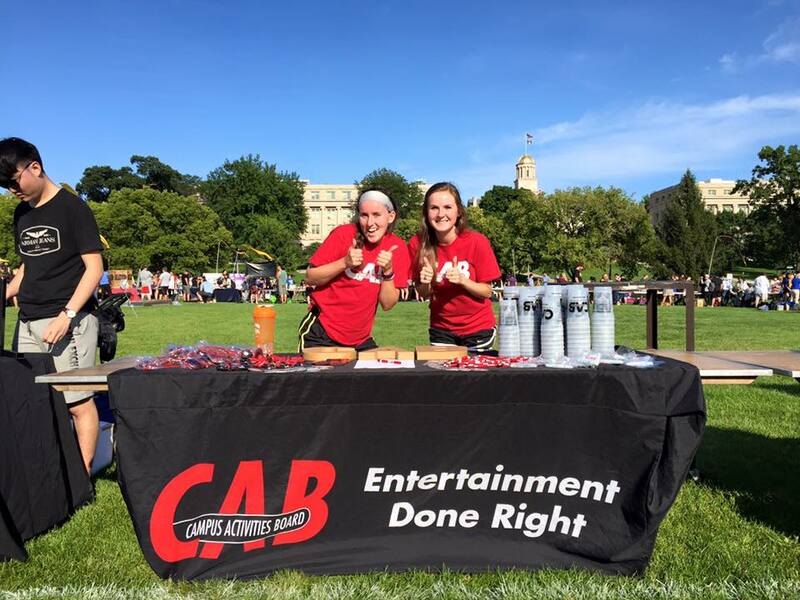 Campus Activities Board is most commonly known as CAB. We provide events and experiences for students and the community. Mission: The purpose of CAB is to provide programs which compliment, reflect, and respond to The University of Iowa community. These programs shall be designed to be educational experiences for those involved in the planning and presentation of programs, as well as, those who participate. Vision: With energy as our fuel and passion as our guide we will create engaging alcohol alternative events for a dynamic and diverse community. Through collaboration and communication, our events will be welcoming and foster productive relationships. In doing this, we will strive to create equitable opportunities that encourage personal growth and invested leaders. Campus Activities board meets every Monday evening. The exec board meets at 8:00 PM, and the rest of the organization meets at 9:00 PM for about an hour. We have a lot of incredible events coming up soon! CAB hosts Trivia Night on the last Wednesday of every month and Make & Takes the 2nd and 4th Tuesday each month; both are in the Hawkeye Room on the Ground Floor of the IMU. We’re excited to bring back our annual Casino Night on Friday, March 2nd. Come to the 2nd Floor Ballroom in the IMU to play blackjack, roulette, and more! CAB is currently on Facebook, Instagram, Snapchat, and Twitter, all with the username uiowacab. Make sure to follow us to keep up to date on all of our events! Any interested Hawkeyes should feel free to first check out our website or our OrgSync page for additional information! If you have any questions regarding being a CAB member, or are particularly interested in the member application process, please be sure to email us at studorg-cabrelations@uiowa.edu.